Today we highlight the dazzling style and colors rather than a striking heel. 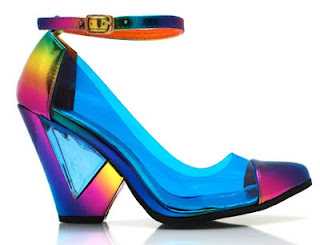 Life is colorful, so why not highlight shoes that show a prism of color. Say hello to the mesmerizing GoJane Pixie Hologram Cap Toe Heel. If you love rainbows, know the awesomeness that was Lisa Frank or love to standout, then these vibrant rainbow pvc and faux leather heel is for you. It also features a adjustable ankle strap, cap toe and a 3 1/2" tinted PVC and clear resin cone heel. Although GoJane has their own collection, I believe these beauties are possibly by Privileged Shoes but research hasn't turned up much to confirm these - anyway, you can get these at www.gojane.com for $80.00.